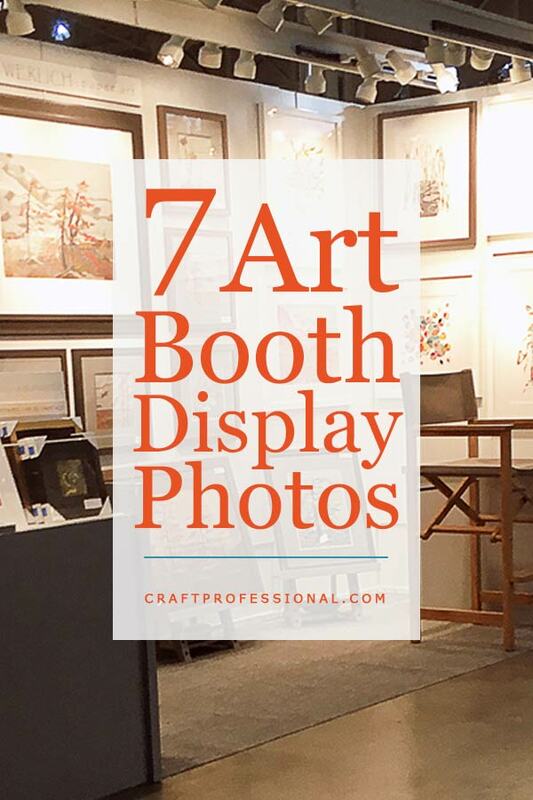 These 7 art booth display photos will help you learn how to display your own original art and prints at craft shows. You'll see how large scale paintings and prints can be used effectively to make an impact and showcase your style for customers. There are booth photos that illustrate the positive effect of using a variety of types of display stands, and you'll discover ways to help draw attention to your booth from a distance. The vivid colors of these gorgeous, large-scale paintings draw the eye from a distance. 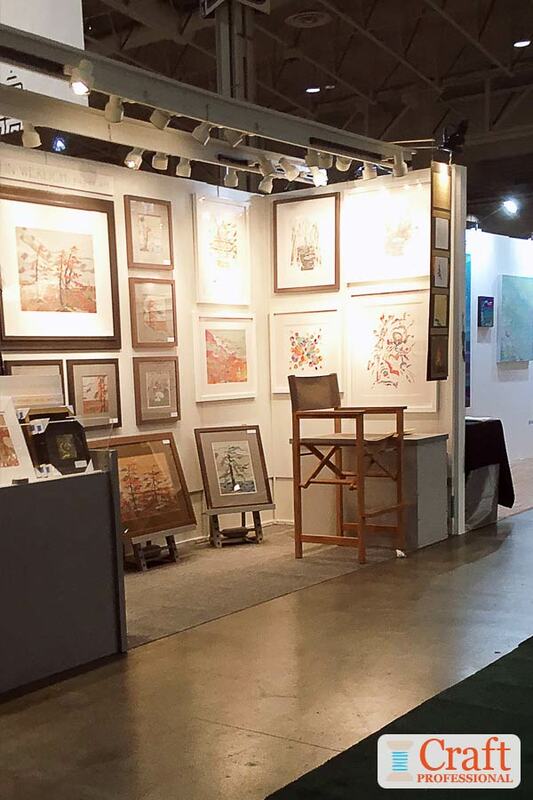 If you're fortunate to have a booth that's open to customer walkways on one side, consider displaying some of your art on the outside wall of your booth space to draw in customers from all sides. Also, notice the paintings displayed here are all from the same series. The unified color scheme and themes of the paintings work to make this display more striking and effective. This art booth display features a large-scale design placed front and center at eye level. The large, striking design gives passing customers a point of focus. It illustrates the artist's style and invites passers by to come in for a closer look at some of the smaller prints. Items are displayed using a combination of art hung directly on walls and shelves holding prints. Mixing up the type of display stands you use can help to soften the look of your display and add interest to your booth. 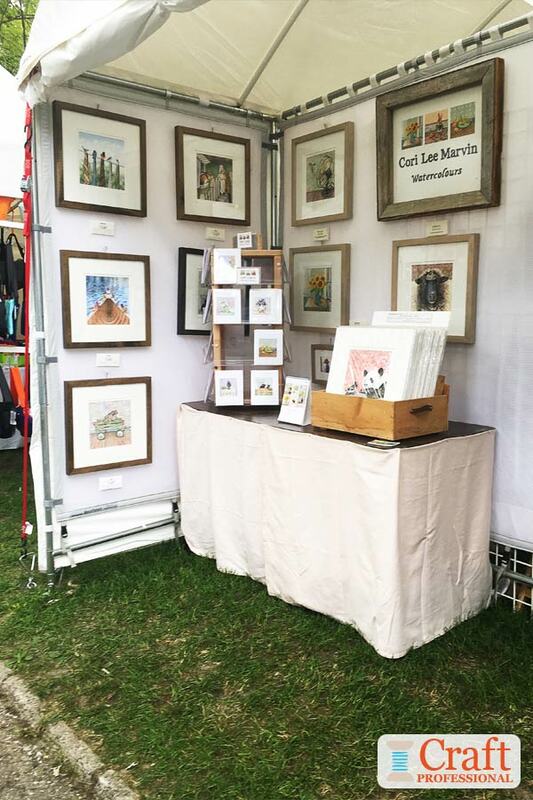 The next art display booth, pictured below, is at a popular and casual outdoor art show. 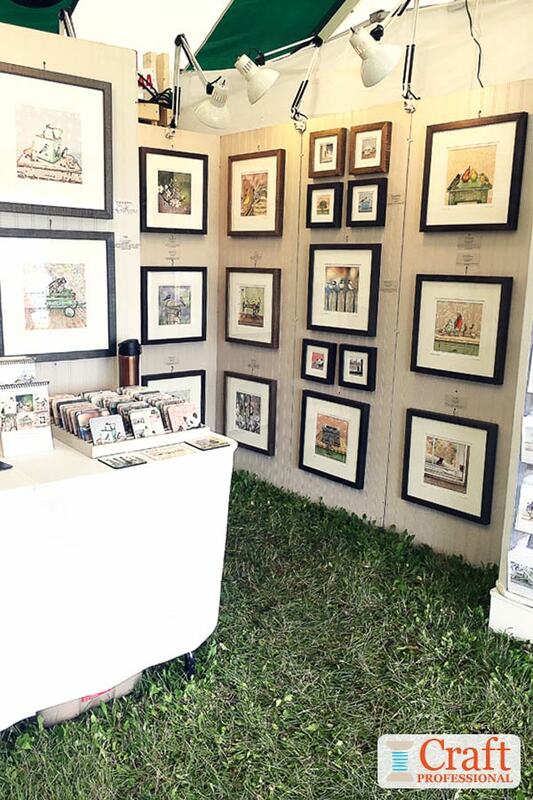 Gridwalls are a popular, portable option for displaying your art on the walls of your tent. 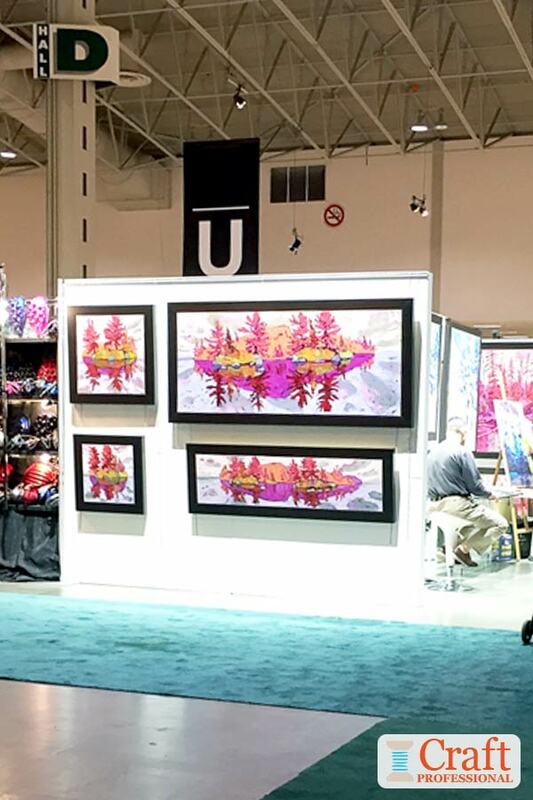 Notice the booth pictured below uses gridwall panels that have been covered in white to create an attractive backdrop for the art that's displayed on them. The card rack on the table at the front of the display allows customers to easily browse. 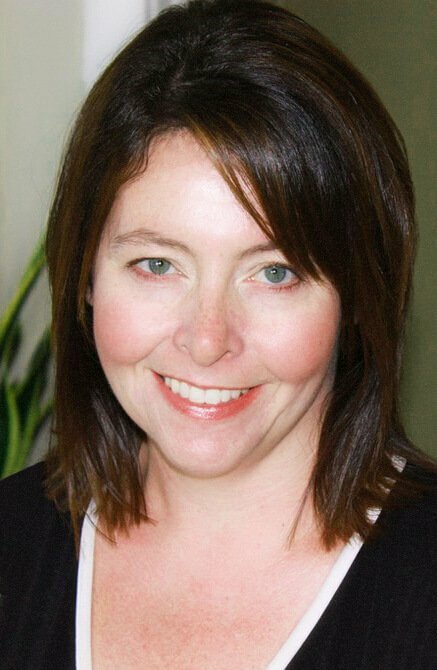 Offering prints in smaller sizes can make your art available to shoppers who have smaller budgets. One of your larger pieces might be out of their budget, but a smaller print might be just right. These smaller items might not represent the bulk or focus of your business, but they can have a positive impact on your profits. This next photo is a little washed out, but I wanted to show the lighting in this booth. Notice there are two rows of lights across the front of the booth lighting up the paintings. These lights can be adjusted and moved along the track allowing the artist to ensure all areas of the space are well lit. A bar height director-style chair fits well with the style of the booth. It provides the artist with a comfortable place to sit, but the height of the chair will make it easier to be engaged and speak with potential customers as they pass by the booth. Here's another example of gridwalls used as a framework to display art. Again, we see they are backed with a white backing. In this case, the booth is under an extremely large tent provided by the show organizers. That blue and white stripe you can see at the top of the photo is the top of the large tent. There are many, many craft artists' booths in 10x10 spaces under that tent. 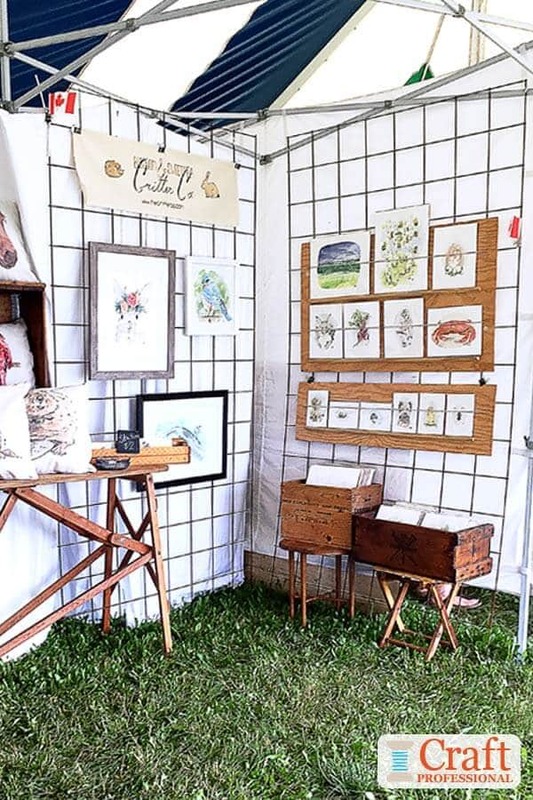 The artist has used her own craft tent as a framework for her booth. She has removed the canvas canopy from her tent frame. It's not necessary at this show because the larger tent provides protection from sun, wind and rain. The tent frame, however, provides a stable base for her gridwalls, and the tent sidewalls (the white you can see behind the gridwalls) block the view into neighboring booths, keeping customers focused on this artist's products. This booth is at the same show as the booth pictured above. Notice the striped canopy peeking out at the top of the photo. I've seen this artist at several shows. She uses different booth setups at different shows, but I find the layout shown in this photo most intriguing. Notice the wall pictured on the left of the photo (with the table in front). This wall is placed in approximately the middle of her 10x10 foot space, dividing the booth in half. I haven't seen the back of the booth, but I assume the artist uses that space to store extra stock and craft show survival supplies that she would want to keep hidden away from customers. This unusual booth layout brings the artist's paintings closer to customers who are browsing along the aisles of the show and makes it easier for people to engage with the work. 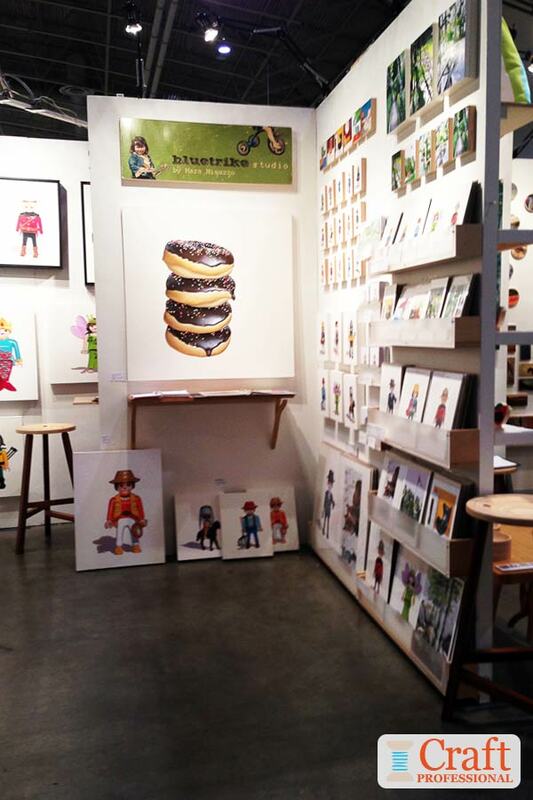 If her art was all at the back of a 10x10 booth, it wouldn't be as easily accessible. The wall is set back far enough that people can come into the booth and get out of the busy aisle. But it's close enough that people walking along the aisles can engage with her delicate painting that feature small details that really need to be viewed closely to be fully appreciated. Here's the same booth as the one pictured above. It's at a different show, and this time it's under the artist's own craft tent. The layout is quite similar except, at this show, the tent frame, along with sidewalls and gridwalls are used to form the foundation of the display. 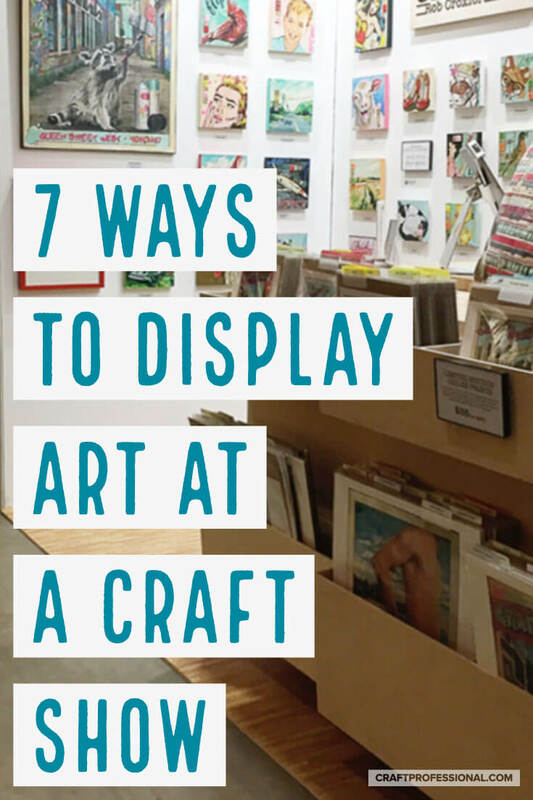 It is a unique craft booth layout, but it's one worth considering if you need a way to bring your art closer to customers who are walking along the aisles at a show. 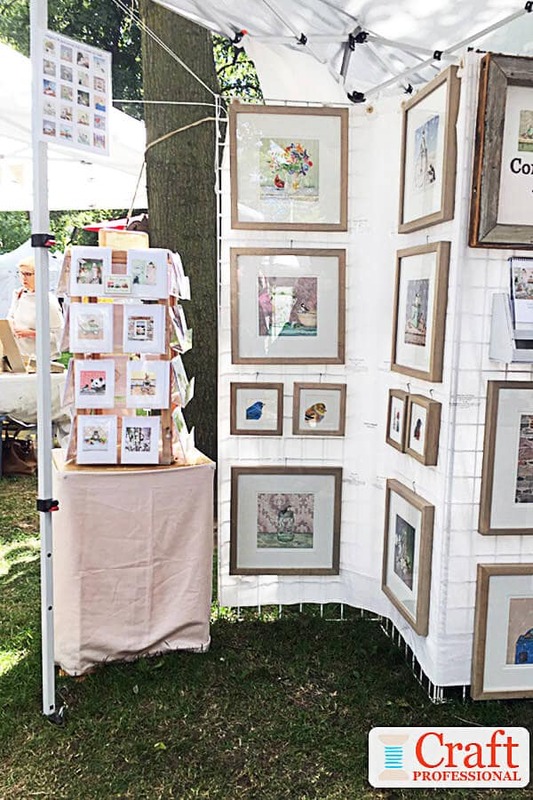 Display Stands for Art Shows: 7 photos show you how to use a variety of display stands to display your art at craft fairs. Art Show Displays: More photos of art on display at craft shows.